Come and join GBNEMBA for a social ride in a classic New England riding spot. Classic yes! Fells is a birthplace of NEMBA, and so conveniently located on your way north out of town. Stop by, let the traffic die down and ride your bike for few hour with some people. You will enjoy some rocky and root laced single track trails intertwined with some fire roads and hills, let's not forget the hills. We meet at Fallon Rd in Stoneham MA in a small lot right across from RT 93 off ramp. Please be ready to ride at 6PM. What to bring? a working Mountain bike, helmet, water and whatever you need to be outside for couple of hours. Each ride will be lead by a ride guide and a sweeper this is no drop ride and we come back to the lot before it gets dark. We will break up in few ride levels such as slow, slower and slowest. But only at the beginning of season as we will slowly introduce fast, faster and fastest as the season progresses. 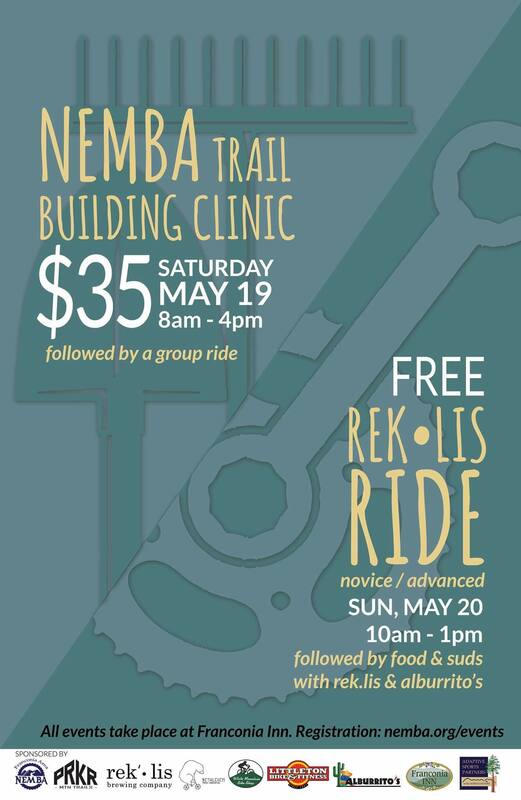 Join Merrimack Valley NEMBA for a day of riding at Lowell-Dracut State Forest. There will be led rides for beginners and intermediates, and marked loops for everyone. There will also be bike demos from some local shops, as well as food available. Come ride off the pie! Wheels down at 10 AM. Adult intermediate and expert, juniors intermediate to expert, no drop. We will split into groups ranging from fast and furious to intermediate, intermellow, social, antisocial, dawdling and diffident. Please note that while the tail will be chill, this is not beginner friendly territory. A bike clear of mechanicals and a fitting helmet is a must, as are plenty of snacks and liquids, tools, a correct size spare tube, and temp appropriate breathable sheddable packable clothing. The Quiet Corner Chapter of the New England Mountain Bike Association is holding FREE guided mountain bike rides at Goodwin State Forest as part of The Last Green Valley’s Walktober series. Registration starts at 8:45AM. Off-road bike and helmet are required. Rain date: Sun, Oct 20. Join us Saturday October 27 at 10am for the 5th Annual NEMBA Halloween Ride & Costume Contest, Rockland, Deadhill Road, Durham, CT.
Come in costume for this fun intermediate, no drop ride. Prizes given to the best 4 costumes! Afterward stay for snacks, Tony’s Square Donuts, cider and cheer. We will also be collecting donations for Where the Love is Animal Rescue, so bring your $$ or pet food donations! This rescue group also needs dry dog food and donations of cleaning products and cleaning supplies--paper towels, lysol wipes, bleach & laundry soap. Meeting 3.30, wheels down 3.45. Ride location will vary every week. Contact me @ mstokes@gmail.com for this week's ride info. Helmet, full-fingered gloves, working bike required.